What is My NH Injury Case Worth? In New Hampshire, accidents happen every day. Some are severe, even fatal. The fatality rate of persons killed by motor vehicle accidents in NH remains steady year after year. These numbers could rise with the mass amount of smart phone usage and texting while driving increases. If you are looking at filing a legal claim or lawsuit due to injuries sustained through the negligence of others, you are probably wondering what your injury case may be worth. There are a lot of factors that will decide the dollar amount, however you must first determine if there is enough evidence to prove negligence, if the injuries are causally related and severe enough to provide for a monetary recovery or settlement. In the end, it boils down to the damages sustained. You have to determine what your injuries cost you physically, mentally and monetarily. When it comes to personal injury cases, the company or the individual who is responsible for the accident can be held liable and ordered to pay monetary compensation to the injured party. Damage awards can be determined by a negotiated settlement between the attorneys, insurance company and the parties involved, or a jury and judge can decide at trial. If you have been seriously injured in an accident or collision, it’s important that you discuss your case with an experienced injury lawyer. If you are called or approached by an insurance company or anyone you do not know, DO NOT speak to them about your accident or sign anything. Call an experienced injury attorney to help you handle your claim. Insurance companies may try to get a statement and possibly want you to sign a medical release form. An award that covers any medical care for treatment received from the accident, as well as any care you are going to need later on down the road. 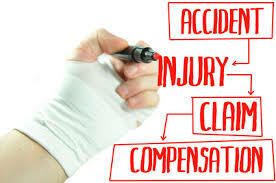 You might also be entitled to receive compensation for any lost wages from the accident, not just money that you have lost already, but money for the future as well. If any vehicles, personal items or clothing were damaged from the accident, you can get repairs and compensation reimbursed based on what the value of the property was that you lost. If you have experienced pain and suffering, you may be able to receive compensation for that as well. Even though emotional distress is often linked to the more serious types of accidents, compensation for the psychological impact from the injury, such as anxiety, fear and loss of sleep is also available. When you are unable to enjoy your normal daily pursuits like exercise, recreational activities and hobbies, you might be entitled to loss of enjoyment compensation. For personal injury cases, damages for loss of consortium often relates to the impact and losses your spouse has sustained. For those who were even partly at fault for the accident, your award can be reduced by your percentage fault. You are responsible for not being negligent in your own activities. After your injury, you are also expected to do certain things to minimize the impact the accident is going to have on you financially. If you aren’t doing something that you should be, you might find your award being reduced. Often times, these can be complicated issues and it’s important to discuss them with your personal injury lawyer.